The cyclone threw normal life out of gear as heavy to very heavy rains started lashing East Godavari district since late Wednesday night. KAKINADA: Cyclone Titli, a very severe cyclonic storm, hit the Andhra Pradesh coast early on Thursday. The cyclone threw normal life out of gear as heavy to very heavy rains started lashing East Godavari district since late Wednesday night. Seawater entered houses at Uppada in East Godavari district as the maximum of the height of the tides was of 10 ft along the coast close to the point of landfall. 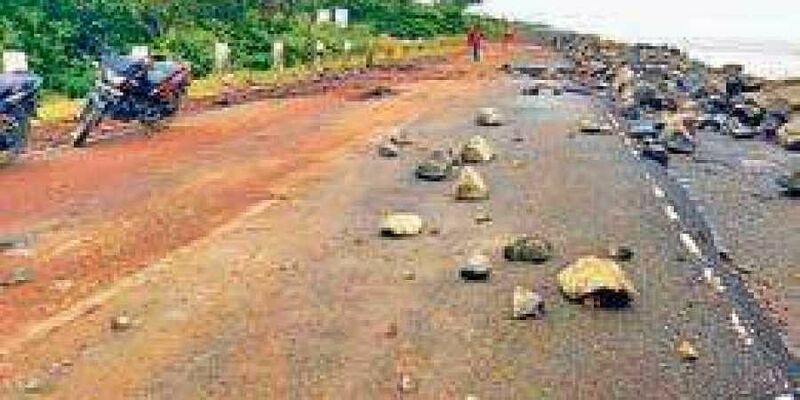 The highway in the Uppada-Kakinada stretch was closed for traffic as a precautionary measure. “Of the 67 fishing boats that had ventured into the sea over the last few days from Kakinada, 65 had returned to the shore safely,” the Chief Minister’s Office said. Fishing boats anchored along the coast were either washed away or damaged due to the tidal waves. The road between Uppada and Kakinada was cut off as the waves damaged the embankment and the sea water overflowed the beach road, an official said.All nine coastal districts in Andhra have gone on high alert as the cyclonic storm is heading towards the coast. Control rooms have been set up.